1. No compelling headline – How are you going to get people to buy when the first thing they see on the page isn’t inspiring? I would argue that your headline is the most important aspect of the copy on your page. The key is to tell the visitor exactly what you are offering while also making it appealing so they will read on (and ultimately purchase). 2. No attractive benefits – We’ve all heard the adage features vs. benefits. The features are what you, as the marketer, believe about the product but the benefits are really what the visitor wants to know about. They don’t care how your SEO service works, all they care is that it will get them in the top 10 search results. 3. No bullet points – Spelling out the benefits of your product/service is a lot easier when you use bullet points on your webpage. This will make it easier for the visitor also. 4. Sentences too long – This is often one of the biggest challenges in writing copy. But the trick is to know when to end a sentence and start a new one. Here’s the trick: read the sentence out loud and as soon as you run out of breath, that’s when the sentence needs to stop. 5. Hard to understand jargon – This is probably the most common sin in copywriting. But just remember that not everyone who is looking for your product is as educated as you about the product or your industries terminology/language. Spell out the product in layman’s term [plain English] without talking down to them. 6. Spelling/grammar mistakes – This is the easiest sin to avoid. Don’t assume that a common spelling/grammar checker is going to pick up all the mistakes. Read back over your copy carefully or give it to someone else to check who hasn’t seen it before (fresh eyes). 7. No break in ad copy – Put yourself in your visitor’s shoes. How aggravating would it be to visit a website and find a page full of text? People don’t have time or the patience to read through such a large amount of text (not to mention it would look pretty ugly). Use relevant images to break up the text such as a call to action button or an image of your product. Avoid these copywriting sins and you will be well on the way to ensuring visitors stick around on your page (and convert to paying customers). INTERACTION TIME! 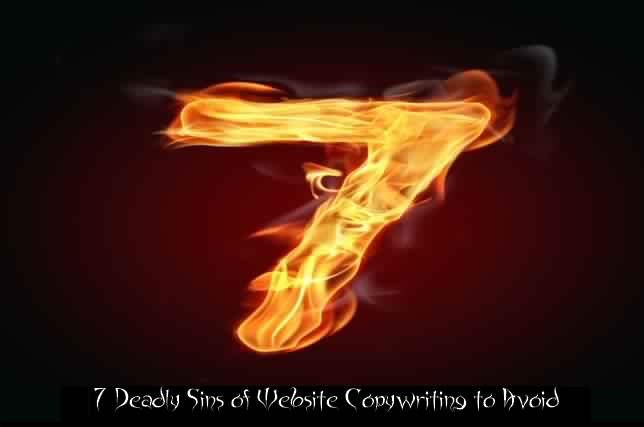 – You have avoided the 7 Deadly Sins Of CopyWriting for the Web; Don’t commit another… Be sure to engage and interact with your audience. Your followers are interacting with you! Check out what they wrote and respond, to keep these direct discussions and engagement ongoing.